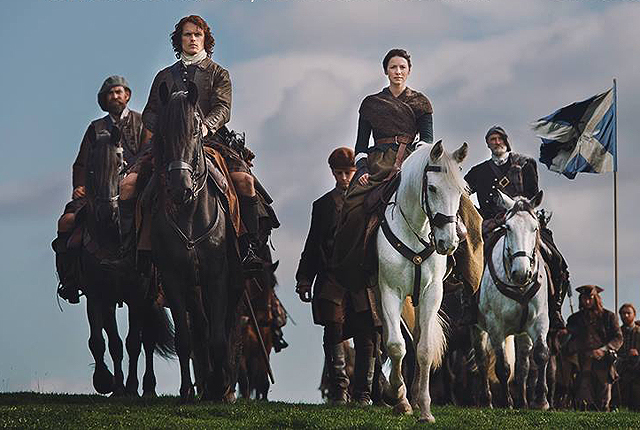 Today Starz, in association with Sony Pictures Television, announced that season three of the Golden Globe nominated series Outlander will return in September 2017. Outlander Season 3 will include 13 episodes based upon “Voyager,” the third of eight books in Diana Gabaldon’s international best-selling “Outlander” series. Check out a special video below as co-stars Caitriona Balfe and Sam Heughan say “Goodbye to Scotland”! In March, production and filming on the current season moves from its home base in Scotland to Cape Town, South Africa, to shoot pivotal sea voyage scenes on the former sets of the STARZ original series Black Sails. Production on the season began in September 2016 and will wrap in June 2017. Outlander will attend San Diego Comic Con again this summer, offering fans a chance to experience more of this beloved series in person. Diana Gabaldon’s eight-book “Outlander” series has sold more than 26 million copies worldwide and all the books have graced the New York Times best-sellers list. The Outlander series spans the genres of history, science fiction, romance and adventure in one grandiose tale. The second season of Outlander won the Critics’ Choice Award for Most Bingeworthy Show, and four People’s Choice Awards, including Favorite TV Show.